Piriformis physical therapy uses exercises and stretches to address structural and functional issues that might cause pain through several distinct mechanisms of action. Physical therapy is a great treatment for most piriformis diagnoses due to its effectiveness, safety and general health benefits. Physical therapy certainly embodies the definition of constructive care, as opposed to the negative implications of pharmaceutical, injection-based or surgical therapies. Physical therapy is one of the most respected of all medical specialties. Physical therapists and PTAs work directly with patients, often forming strong bonds with their clients. Since patients must work through pain using physical modalities, it is vital that they learn to completely trust their therapists to help them in their recovery efforts. This dialog investigates the common use of physical therapy practices for a variety of piriformis diagnoses. We will explore the benefits and limitations of care, as well as detail why some physical therapy might fail to deliver satisfying results. Physical therapy employs a wide range of practices to help repair injury, address structural abnormalities, resolve functional issues and rehabilitate tissues. Physical therapy is used extensively for all types of piriformis pain conditions, including injury, RSI, muscle imbalances and piriformis syndrome, demonstrating excellent results for each and every one. Physical therapy consists of exercises, stretches, mobilization techniques and other practices that help to repair, strengthen and improve the piriformis muscle in both form and function. Physical therapy can be custom-tailored to provide ideal care for any type of piriformis disorder, making it an incredibly versatile treatment method. Physical therapy is not a passive modality, but instead requires the patient to put forth effort and active participation in the treatment. This is certainly a positive attribute that helps to explain its efficacy. Typically, patients meet with their therapist one or more times a week and will be instructed to perform a set routine of exercises, activities and stretches at home on a daily basis, as well. Many physical therapy practices can be maintained through self-managed care once formal treatment is over. These programs might help to prevent future recurrences of piriformis pain once the current symptomology resolves. Physical therapy is a truly constructive treatment, meaning that participation provides overall health benefits besides simply addressing pain and piriformis dysfunction. Physical therapy is actually good for you, unlike drug, injection or surgical practices that are damaging and risky. Better still, physical therapy is very effective for addressing the diversity of piriformis diagnoses. It can help to repair and rehabilitate injury to the muscle, as well as decreasing the collateral effects of RSI-related pain. Physical therapy is the very best way to resolve muscular imbalances and is used extensively to identify and correct problems within antagonistic muscular pairings. Piriformis syndrome patients can also benefit from physical therapy and some can even find true cures for sciatic or pudendal nerve compression syndromes using this organic care method. Physical therapy provides all these rewards without any major risks. Research shows that PT also provides collateral positive health benefits that can increase overall wellness, reduce blood pressure, improve cardiopulmonary function and even help assist patients in stress relief and improved sleep patterns. Physical therapy requires effort and therefore is not always a good fit for lazy, unmotivated patients who prefer to simply take a pill and go to sleep. Physical therapy can be a shock for people who are acclimated to a sedentary lifestyle, but can still work well as long as the therapist can get the patient interested and motivated to try their best. Regardless of the knowledge or skill of the therapist, if the patient does not cooperate, results will be limited in their benefits. Some patients find physical therapy to be far too painful, especially when they are having an acute presentation of piriformis pain. Therapists are always reminded to be understanding of the difficulty involved in mobilizing acutely painful anatomical parts, but must still try to push their patients conservatively to achieve their goals. Some patients might require pharmaceutical or injection assistance so that they can manage the pain enough to successfully perform therapy. While this is acceptable, therapists must closely monitor the patient to be sure that PT remains the primary goal, rather than simply allowing them to escape their suffering using a continual reliance on drugs. Finally, physical therapy might provide poor results for some patients due to idiopathic reasons. 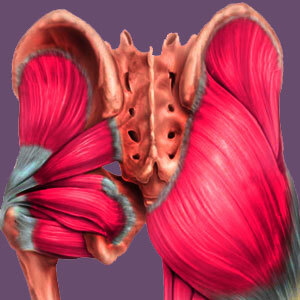 In virtually all cases, this indicates a misdiagnosis of the piriformis as the true underlying source of pain. Remember that mistaken diagnosis is a truly epic scale problem in the dorsalgia industry and is seen often in piriformis pain sufferers. If PT fails to deliver, we usually recommend reconsidering the validity of the diagnosis, since this is most likely where the problem resides.